You know what they say, home is where the heart is. Today, there's a lot of available modern designs you can copy for your your home. Bask in comfort and style, as you relax after coming home tired of working all day. You can stay indoors during the holidays while you invite friends over for dinner. This will be a good investment for you and your family. While Filipinos love gatherings and parties, check these styles which will welcome and amaze your guests definitely! 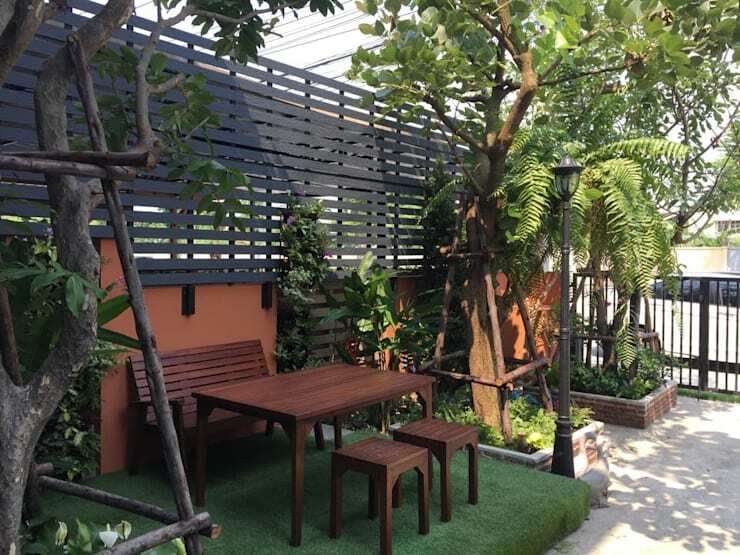 From the facade of your home, incorporate a small garden to convert it into a small living corner. Raise the floor slightly higher and add some artificial grass to blend the surrounding trees. Also put simple wooden chairs and table for your regular sessions of morning coffee and afternoon tea chats. 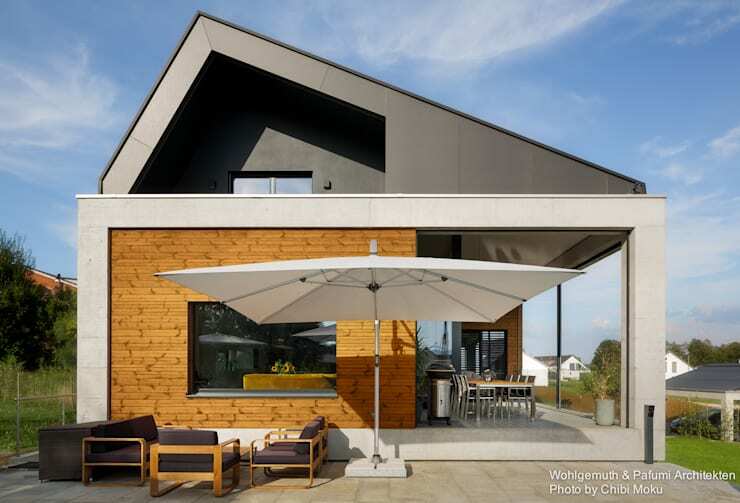 This house boasts of a modern structure using geometrical shapes. 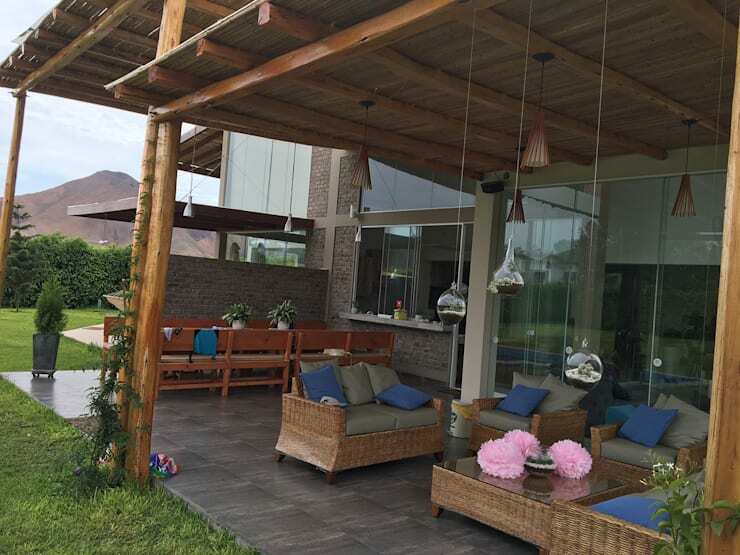 This house model also offers a lot of outdoor seating areas for the ultimate group or family bonding, whenever wherever. Utilize the front area by having an outdoor living area to serve as a gazebo. Set up a white umbrella to provide a shade from the rain and sun. Sit comfortably in stylish black-and-wooden couches as you unwind and feel the natural atmosphere. See the stunning combination of black, white and brown hues that creates the coziest look perfect for homes. Match the outdoor living space with a trusty grill and cook some barbecue on sunny days. This is another good idea that you can establish for your home. Create a refreshing ambiance just like in the tropics! Plant bushes and grasses all over your lawn. 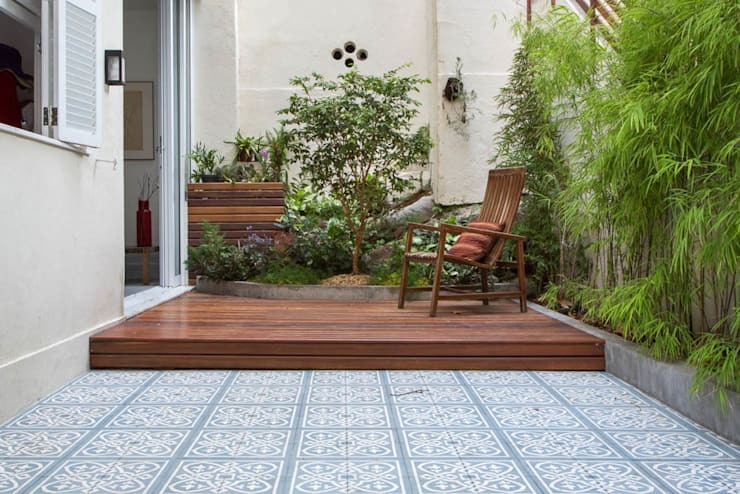 Use a natural tile, laminate or wood, for the grounds of the seating area. Decorate with by choosing the appropriate furnishings such as chairs and tables made in wooden materials. Make sure there is a lot of open space and enjoy the fresh air! We can design the home beautifully with functionalities certainly on point—it will make every homeowner happy again. 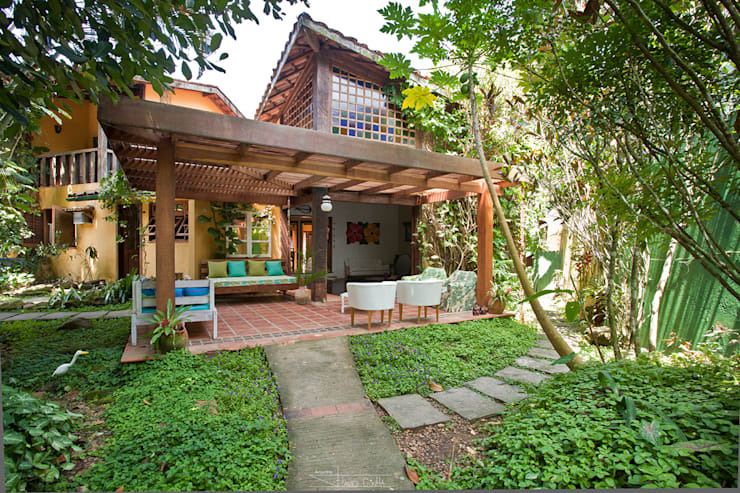 This house has an interesting corner upfront—a patio on a lower level with a comfy sofa plus a couple of sweet hammocks for the gang. Keep an open space at least on the two sides of the walls to have an airy and cool atmosphere. Install yellow lights that will warm and cozy up the mood by night. Having greens inside your house will truly give a therapeutic feeling. Escape into a Jamaican paradise just in your living room by investing in rattan furniture with cushions. The floor is carpeted with natural fibers that blend in with the vertical garden behind the back wall. Who says you can't put freshness and comfort in one corner! 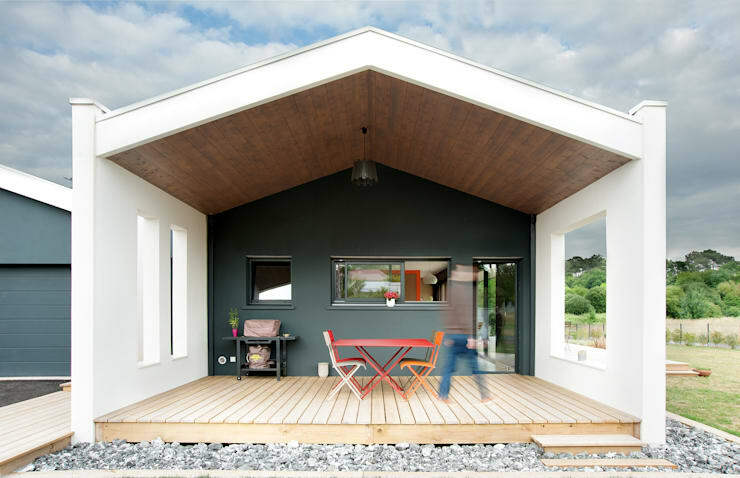 This house is designed in modern style, with the patio protruding upfront. Install clear glass doors to establish a classy and spacious look. And to finish the overall design, complete the cool atmosphere by decorating the seating areas with natural elements and colors, from the sofas and cushions. You can invest in stylish rattan furniture. This home design is good for those with limited available space. 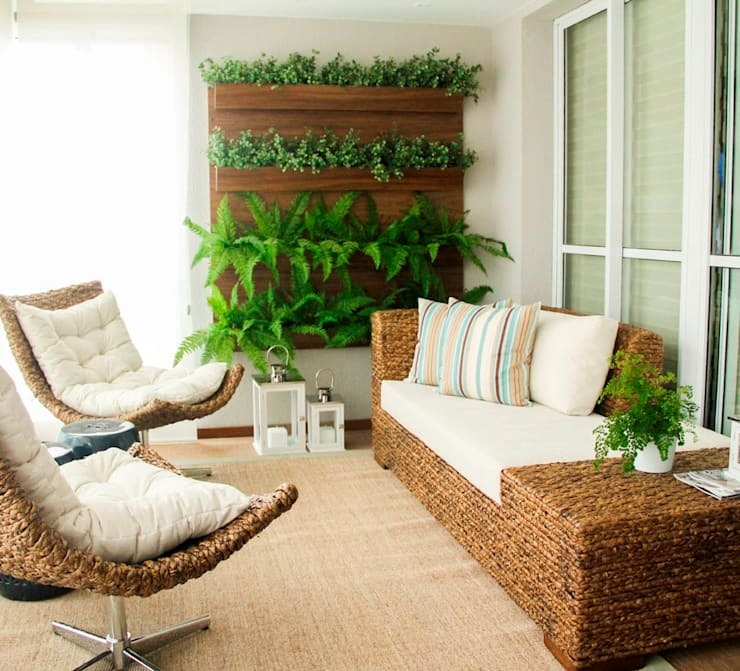 Achieve this look easily with chic wooden chairs and rich green plants on the background. It would also be better to elevate the flooring with a wooden platform. You can say that this is a pocket garden at your own convenient space. Now this is a simple and modern look that makes use of bold and matte colors. The gable roof design houses all the furnishings and decor in a variety of solid colors. And to complement such fusion of shades, the ceiling and flooring are made with wooden materials. For the eccentric ones, this is an attractive living room that you can copy! This house design combines the concepts of architecture and nature harmoniously. Decorate with a variety of chairs to match its wooden square roof. Make sure to use colors in the same palette, preferably earthy tones. We have come to the final model in this ideabook. Nothing's more relaxing than a fusion of light pastel colors. Utilize every inch of space by making a seating area pinned to the wall and scatter soft-colored cushions for additional design and comfort. A light shade of wooden flooring will also match the dainty setup. You could also use a nice hammock under a large tree to create the perfect haven for relaxation. Moreover, sprinkle the extra wide space with white pebbles to add variety in design.